The Superior Spider-Man ride hasn’t always been a smooth one, and as recently as two weeks ago, I was starting to truly question the direction of this series and how it would transition in a rebooted “Amazing” era next month. But in Superior Spider-Man #30, Dan Slott, as he’s done numerous times before, has found a way to put my worst fears about my favorite comic book superhero at ease. There’s still one more issue left in this series where a lot can happen, and a number of loose threads that need to be addressed for me to fully declare this landing “stuck,” but I undoubtedly believe this storyline is in a much better place than it was two weeks ago. And that’s not just because of the return of the one, true (and “superior”) Spider-Man, Peter Parker at the very end of Superior #30. 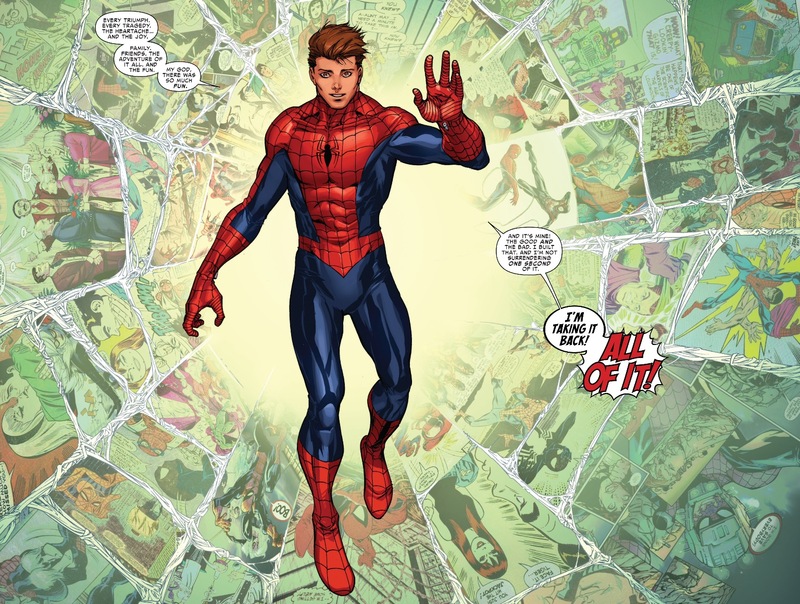 Peter’s return has been imminent and inevitable for months, but the big question continued to be how and under what conditions would Slott and co. bring him back. Again, a big part of me doesn’t want to take anything at face value because there’s “always a catch” when it comes to a Slott story (as he would say himself). However, unless there’s a major curveball thrown at the very last second next issue, my very worst fears of the Doc Ock as Spider-Man era continuing on well past its expiration date, have passed. From almost the very beginning of the Superior era, I was hopeful that this storyline would follow a specific arc: Otto sets out to be superior, demonstrates that he can be a hero, he becomes arrogant and starts to slide, he realizes the error of his ways and redeems himself by yielding control of Spider-Man’s body back to Peter. For me, this was the storyline that just made the most sense. It gives you a sense of redemption for Otto, while also reaffirming that Peter, flaws and all, is still the best superhero out there. I never bought into the fact that the point of Superior was to belittle Peter, or to put Otto’s methods on some kind of pedestal. People who thought that were taking the book’s title way too literally. Everything that Otto has been doing has been measured against Peter, even in the issues where Peter wasn’t present in physical or astral form. 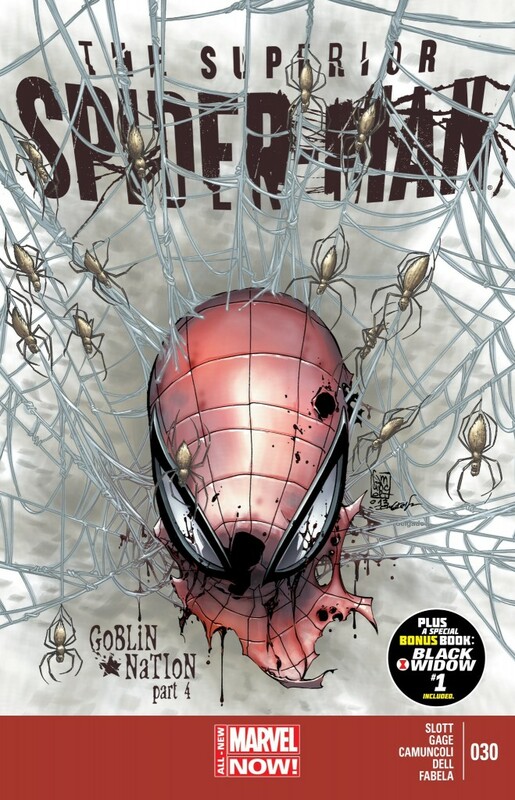 I have said countless times that Superior Spider-Man is a referendum on what it means to be Spider-Man. And now the results of that referendum appear to be in, and Peter, as we suspected is actually the “superior” one. Having Otto’s love for Anna Maria as the impetus for his awakening works for me. Maybe it’s because I’m an old romantic at heart, but I see a man in Otto Octavius who can now admit that he has been completely outclassed and outfoxed by the Green Goblin. He has no leverage and no ability to gain any. His inability to find and/or rescue Anna Maria is his ultimate failure as a hero, which naturally leads to his greatest triumph as a hero – realizing that he was never a “true” hero at all. The Peter/Otto scenes in this issue are another demonstration of how Slott writes some of his best stuff when he’s backing the drama and the explosions down, and focusing more on the characters. The quieter scenes are such a strength of Slott’s, I don’t understand why he doesn’t write them with more frequency. I know he wants to make sure readers get some bang for their buck and pack a lot in, but less can truly be more sometimes, especially when you’re dealing with two characters in Peter and Otto who are a lot of fun to read about. I loved the fact that this comic shows of just how well Peter and Otto now understand each other. Otto talks in this comic with such introspection and awareness. He admits to his own shortcomings, but in true Otto fashion, even when he’s down and out, he reminds Peter that he sells himself short when he shouldn’t. Otto may be a murdering sociopath, but his brilliance can’t be quesitoned. He and Peter are truly cut from the same cloth, but their backgrounds and life experiences have just caused them to travel at divergent paths. Or does it? At this point, even after witnessing Otto wipe himself out, it’s impossible to know for certain if Peter and Otto’s interaction truly ends here. I’m going to go out on a limb and say it doesn’t. When Peter tells Otto that you “do the right thing … even it means giving up the advantage …” those words ring in my ears like church bells. Is Otto conceding his position just one more mind game from the “master planner” himself? Does Otto now have Peter right where he wants him? Anything is possible. There were obviously a few other things of merit that came up in this issue. 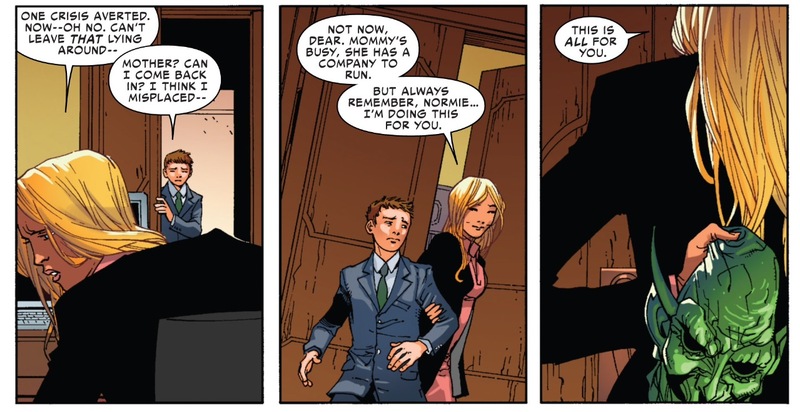 Most importantly for all of those who have been following the Green Goblin identity mystery so closely, we see a certain ex-wife of a certain son of Norman Osborn holding a goblin mask behind her back while taking to her son Normie. Is Liz Allan working with Norman Osborn or is this just one more red herring from Slott? Similar to what I said in my thoughts about last issue, I think I’m well past the point of truly caring about the Goblin mystery, though if it is in fact Liz Allan, depending on the explanation given, I could totally buy into it. Additionally – and apologies for keeping this charade going – I also wouldn’t be surprised if she was holding the mask for somebody else, or even hiding it from them. I don’t know, maybe someone like her son Normie? J. Jonah Jameson’s time as New York City mayor also appears to be marching towards an inglorious conclusion. With his cabinet mostly gone, and his business partners at Alchemax throwing him under the bus, is it really possible for Jameson to maintain his position of power in the greatest city of the world? And if Jonah is not longer the mayor, where can he possibly go from here? Of course, the biggest plot point that will need to be dealt with is the world that is waiting for Peter once he is back for certain. The Avengers are already taking about “arresting” Spider-Man for his role in Cardiac’s underground clinic. Spider-Man is no stranger to playing the on the lamb, rogue superhero, though I wonder if Slott wants to go back to that well less than 10 years after the last time such a storyline took place. One more issue to go here for Superior Spider-Man. I’m legitimately excited to read it and see how Slott is going to torture all of us headed in ASM volume three. I’m expecting to be enthused and enraged by whatever we get in two weeks. As long as it’s some combination of those emotions, I’ll be a happy camper. Yeah I don’t think I’ve disagreed with one of your reviews more. This issue was a catastrophe. I’ve agreed with you for a while that the ending should be Otto failing, recognizing his short comings, and making the sacrifice to let Peter take control again. And while that’s sorta what happens the execution was a joke. Nothing in the issue prior to the very end in any way suggested Otto had recognized his failings. He recognizes that the Goblin has outsmarted him but in the scenes with 2099 he’s still every bit as arrogant. Nothing about that scene implies he’s learned anything. And it continues during the chase into the tunnels. The idea that the scene with the train was supposed to be the straw that broke the camel’s back just doesn’t make sense. Not to mention my biggest problem with this issue which is that it basically makes the 31 memories thing pointless. I wasn’t a fan of the soft reboot thing, but I understood it. Now that entire thing is irrelevant. It doesn’t help him escape Otto’s memories, it doesn’t help him beat Otto in another mindscape battle. It serves no purpose. It’s irrelevant to the resolution. Well, please keep in mind that I don’t think the execution was flawless and when I actually have to provide a designated “grade” for the comic in the podcast, that will be reflected. I don’t think this is the greatest issue of Spider-Man in years, or even one of the best of the series, but it does course correct what felt like a disastrous direction for this franchise. Whether or not getting to the place we ended in Superior #30 felt climatic or not is more of a demonstration of the last few issues of build. With that said, I obviously disagree some of your points. 1) Otto’s “awakening” was well enough. The train sequence was effective. 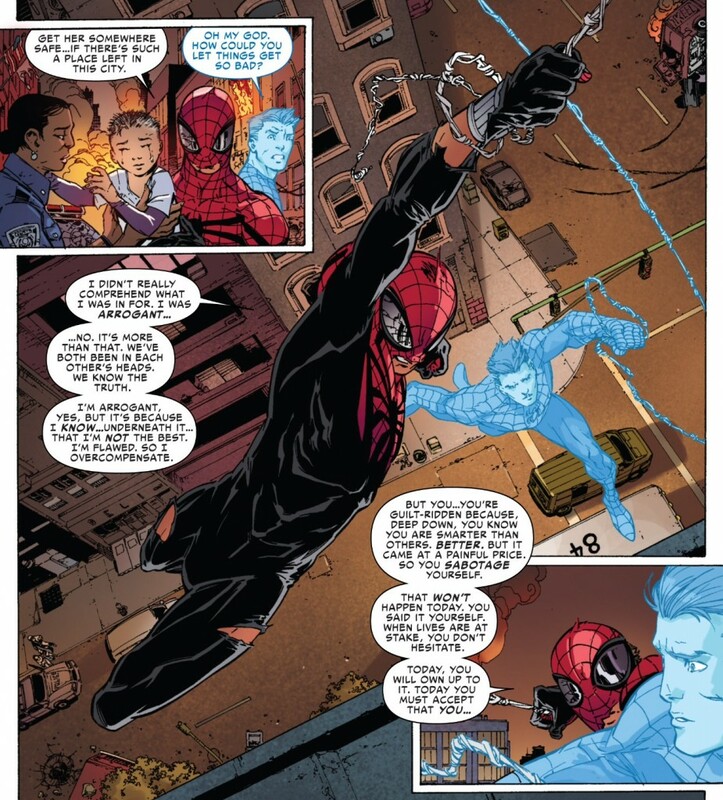 He was deceived into thinking he was saving Anna Maria, found someone else, had his moment of hesitation which actually mirrored Peter’s moment of hesitation in Superior #9 that caused him to be wiped out. 2) 31 memories is not null and void. Peter was left with 31 memories to try and find his way back and the specific ones he had were the ones that properly motivated him to keep fighting. Entering Doc Ock’s mindscape or whatever allowed him a more circuitous route to get everything back. 3) There’s still one more issue left and I think anyone who thinks Otto’s story is over here is fooling themselves. Let’s see how this wraps before we start declare everything resolved. Not to keep fighting about it but I disagree on the memory thing. Maybe this was just me, although I don’t think that, but I didn’t read the 31 memory things as saying that those were what kept him from being erased. It was impossible to erase him because Ock was in his mind with some of his memories. It’s Ock searching through those memories that gives Peter a chance to come back. I think you and Dan even mention on the podcast that this was Slott getting the character back to what he was meant to be, but it did more than that. It assigned value and significance to those memories. It set them up to be called back to at a later time. This was the reason he would win if/when Otto realized he was still there. If instead of those memories the mindscape had just been shattered versions of his memories but he saw the common thread of him never giving up in them, maybe have him still not remembering his name, then hiding in Ock’s memories and losing himself until the end would’ve made sense. Instead Slott created a device that doesn’t help Peter overcome anything. Peter doesn’t overcome anything going through Ock’s memories. By sheer dumb luck he’s restored. Peter hid in Ock’s memories to avoid detection, not trying to get all his memories back and he wasn’t an active participant in him finding himself again. It happens because he’s reached that point in Otto’s memory. Why not have him now restored continue in Otto’s mind until the mindscape battle again but this time triumph? Then you could fast forward as Peter realizes what Otto’s done in his time away. You can still have Otto erase those memories and you have a moment where the now stronger Peter triumphs rather than a Peter that’s essentially the same and who only is restored because he reached that point in Otto’s memories. I understand there’s still one more issue and it’s obviously set up to be Peter’s triumphant moment. I’m excited to read that. But Peter’s story since I think #19 has been he’s not whole and can he beat Otto not being so. He should have been a more active force in becoming whole again or by finding himself in Otto’s memories. Hi Mark, Love your blog! I have loved, hated, enjoyed and been angry at SSM and I think that’s what Slott wanted for us— an emotionally driven story that took us through the spectrum of triumph and failure. Parker has always been the Superior Spider-man, and Otto will always fail to Parker is some regard. And this makes for a great foil for these two! I have only one real problem with the story in that it sold Parker a little short. We get the dramatic scene with Peter yelling that he’s ready to “take it ALL back!! !” But really, he doesn’t take back anything. Otto sort of just hands it to him. The same Otto that came up with this brilliant master plan to cheat death, willingly walks into it as a way to save Anna Maria. Through both Otto’s mercy and his cowardice in dealing with his issues, he gives everything willingly back to Peter. Maybe later we’ll find out that Peter’s morality imposed onto Otto DID change Otto for the better, but it’s such an… anticlimatic victory. Otto though he fails time and time again, doesn’t know when to quite. Maybe the fear was that if he kept going he would be responsible for Anna’s death. Or maybe it’s the realization he can’t be a hero (maybe more of an Anti-hero, later. I don’t think he’s gone for good). But to just hand over the reigns seems not very… Otto like. 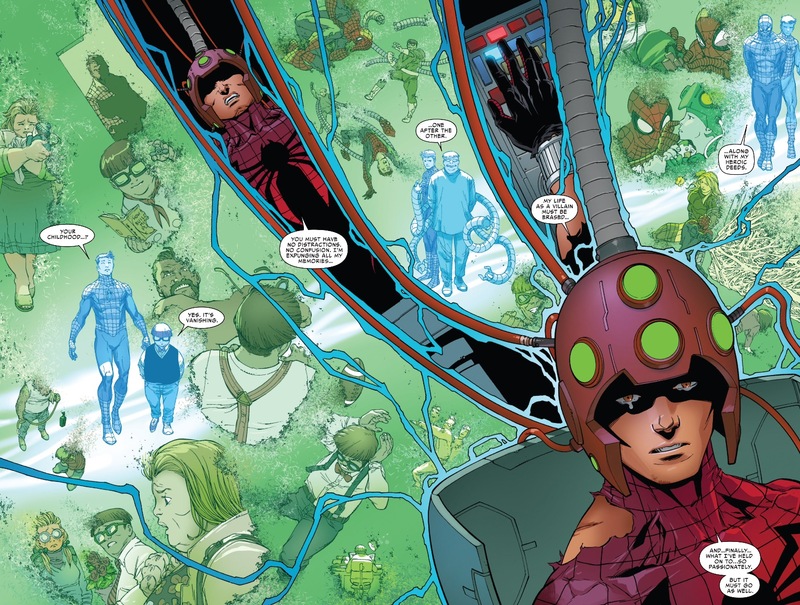 Is Slott’s statement that Otto’s cowardice supercedes his heroism? Or that Otto, though arrogant, has finally learned that there are things even he can’t do, like let Anna Maria down? I get confused with this ending, because where others see that Otto “did the right thing” by giving Parker his life back, I see that he absolutely did the wrong thing. Parker is going to realize he has a doctorate, a girlfriend, a company, that the Avengers are after him and that Black Cat is seeking revenge. All these things that Otto did and will never have to own up to or get the chance to correct. 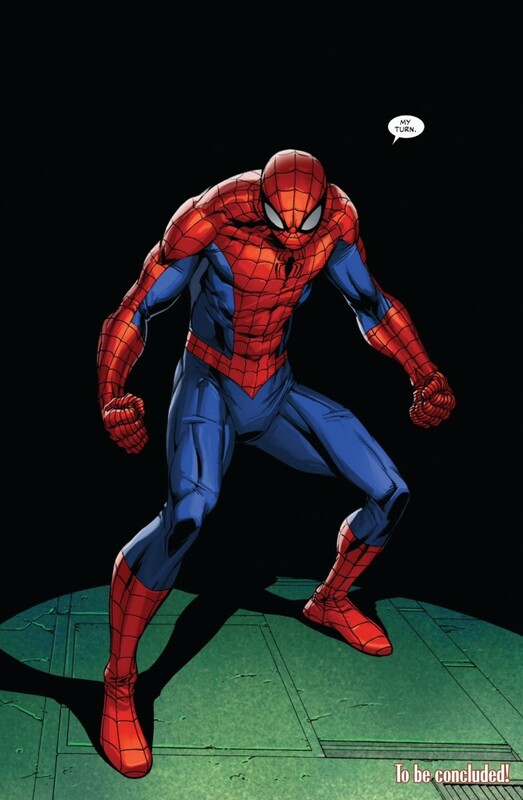 I can’t wait to see what Otto has in story, but I really think if you bring Otto back, you almost have to set up a situation where he comes back as Superior Spider Man (with the Jackal and a few clone bodies running around this is simple enough to write) and then tell a story of Otto finally seeking true redemption for all his actions. I guess the only problem with this though is that that story has already been told in reading about Kaine’s attempt at being the Scarlet Spider. I guess the ending just felt more to me that both Parker and Otto deserved more. Where do you go with Otto at this point?